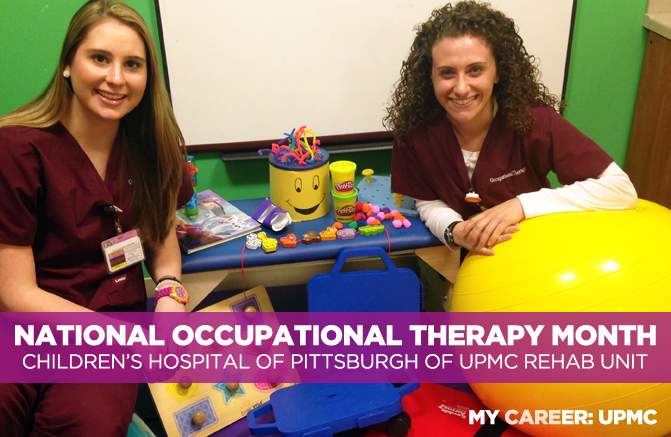 Why do I love being an OT? Oh my, let me count the ways! I think that I have just about the coolest job that there is. Every day I get to go to work and do what I love. I get to work with the most amazing kids and their families. I help them regain their independence to get back to their most important job… which is being a KID! When an individual comes to rehab it can be a scary thing. They are facing new challenges and trying to figure out how to function which is sometimes completely different than they did before. The moment they begin their rehab journey…it is an opportunity for a new beginning, an opportunity to live their life to its fullest potential. As an OT on the rehab unit, I meet the kids when they walk through the door and work with them one-on-one every day until they go home. I become part of their journey and they become part of mine. I get to see them through the good days, the not so good days, the “aha!” moments, the giggles, and also the struggles. We work with them to turn the “ impossible” into ”possible”, and work on turning “can’t” into “will”. I feel so fortunate to have a hand in their care. People say that I change the lives of these kids, but the truth is…I think they are the ones who change my life.